Mega Man Battle Network 4, known as Battle Network Rockman EXE 4​ in Japan, is a video game developed by Capcom for the Game Boy Advance (GBA) handheld game console. It is the fourth game in the Mega Man Battle Network series. 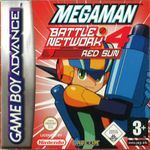 Like the game before it, Battle Network 4 has two different versions, Red Sun and Blue Moon, that differ only in minor story and gameplay details. Battle Network 4 is compatible with the e-Reader, and can be linked up with Rockman EXE 4.5 Real Operation and the Battle Chip Gate for NetBattles. It is able to link with Mega Man Zero 3, and contains references to Konami's Boktai series. Battle Network 4 greatly differs from Battle Network 3 in many ways, the most notable of which is the concept of DoubleSoul (Soul Unison in the original). DoubleSoul is similar to how the classic-style Mega Man could acquire the weapons of the Robot Masters that he has defeated: by using DoubleSoul, MegaMan.EXE could use the powers of other NetNavis in the same manner as how classic Mega Man could use the powers of the Robot Masters through their weapons. To perform a DoubleSoul, which lasts for a temporary amount of time (three turns), however, a chip must be sacrificed for the battle. Another key feature is that it takes a minimum of three playthroughs of the game's main story mode in order to uncover all of its secrets - although many criticize the game for the same reason. After each playthrough, a player is permitted to either continue with their existing game or to start a new game at a higher level of difficulty, although any save at a higher level of difficulty will overwrite a save of the lower level. Thus, it is very important for those players who want to collect all chips and power-ups to be sure that all blue/purple mystery datas and all V1 virus' chips and program advances have been collected before starting Level 2. The same is true for going on to Level 3. Finally, DarkChips, which are powerful chips that give many negative side-effects, make their debut in this game: a mood indicator in the corner of the screen shows the mood of MegaMan, and should the mood change to a negative one, random DarkChips will appear in MegaMan's Custom Screen. Each DarkChip will have many negative (and a notable permanent) side-effects, and will taint MegaMan's own soul with darkness. Should the darkness overwhelm MegaMan, he will find that a different selection of chips are made available to use, with a different selection of Program Advances (like the infamous "DarkNeo" Program Advance, which involves the Bass GigaChip) therein. Also, when you use a DarkChip (aside from the battle with ShadeMan in the ToyRobo and in free tournaments at Higsby's shop), MegaMan permanently loses 1 HP for each and cannot regain all HP lost, even if you were to purify yourself. There are also special chips (like the 5 evil chips) that can only be used if MegaMan is completely consumed by dark power. Conversely, if MegaMan does enough battles (about 1000) without ever using a Dark Chip, he will turn brighter in color and allow him to more easily achieve Full Syncro mode. Source: Wikipedia, "Mega Man Battle Network 4", available under the CC-BY-SA License.